If you haven’t heard of Crystalyne by now, you’re sure to soon. 2014 was a huge year for the band; Crystalyne won Canada’s Bell Media RadioStar contest at the Canadian Radio Music awards, played a huge amphitheater in Toronto and headlined shows all across the country. 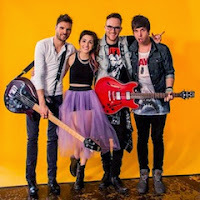 The band got together through a mutual friend that suggested Josh Given, Justin Niece, Scott Blake and front-woman Marissa Dattoli meet up and jam together. They played a few covers while getting to know each other, and just like that, Crystalyne was born. Two weeks later, they were already offered a tour. Crystalyne have a sound reminiscent of Cassadee Pope’s former group, Hey Monday—catchy, upbeat pop-rock with sugary female vocals. The band cites Paramore as one of their major influences, but it goes beyond female fronts. Crystalyne’s song “Ghost” is a gorgeous duet with Abandon All Ships vocalist, Martin Broda, is a fantastic example of what the band is capable of creating. Another standout is the optimistic “Let It Go,” a song with a message about letting go of the little things because life is what you make of it. So far in their career, the band have churned two EPs and have covered various songs on their YouTube channel. They also got the awesome opportunity to release an album in Japan. According to their website, Crystalyne will be releasing new music this year sometime. Crystalyne have accomplished so much in a very short amount of time, and are undoubtedly heading for even bigger and better things. The scene is begging for more awesome female vocalists to take the spotlight, and Dattoli seems poised to do just that. The band as a whole sound more polished and put together than some bands that have been together twice as long. Without a doubt, you’re going to be hearing a lot more of them in the near future.